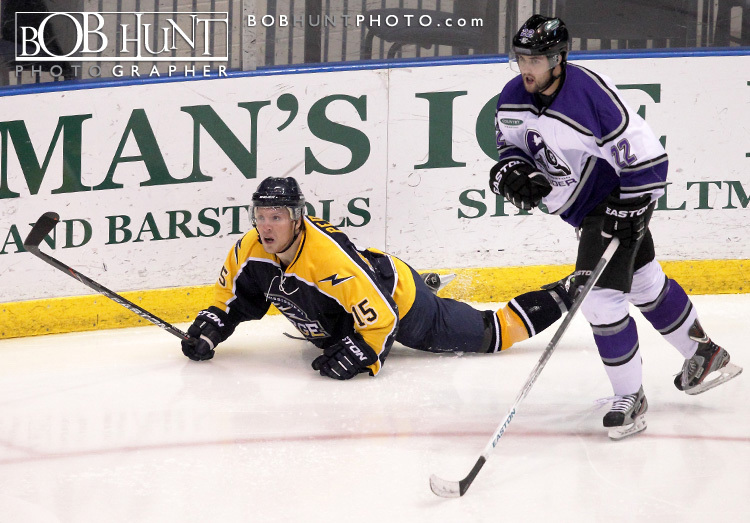 The Bloomington Thunder dropped their final meeting of the season with the Mississippi Surge 6-1 on Sunday afternoon at U.S. Cellular Coliseum. 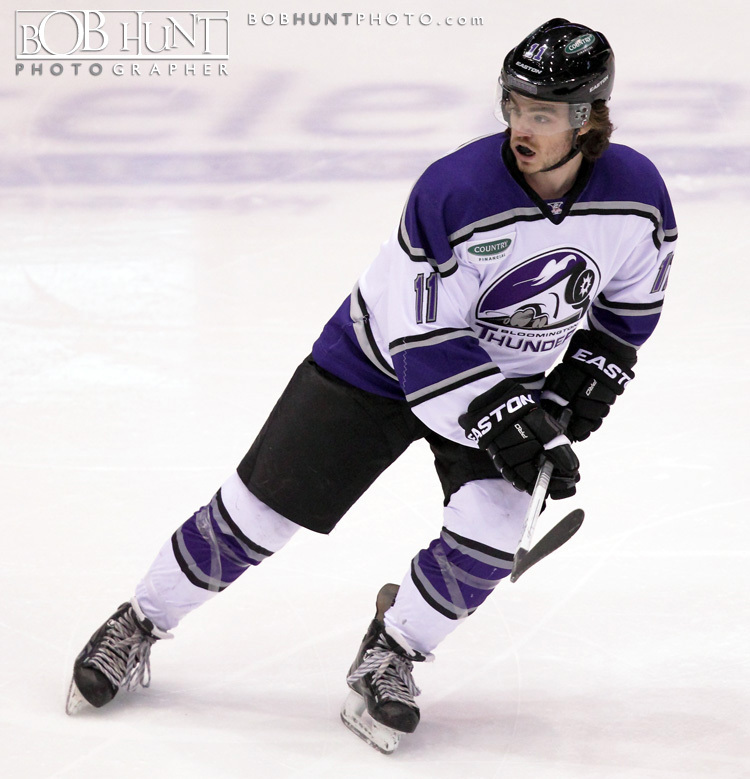 All four first-period goals were scored on power plays to give the Surge a 3-1 lead at the first intermission. 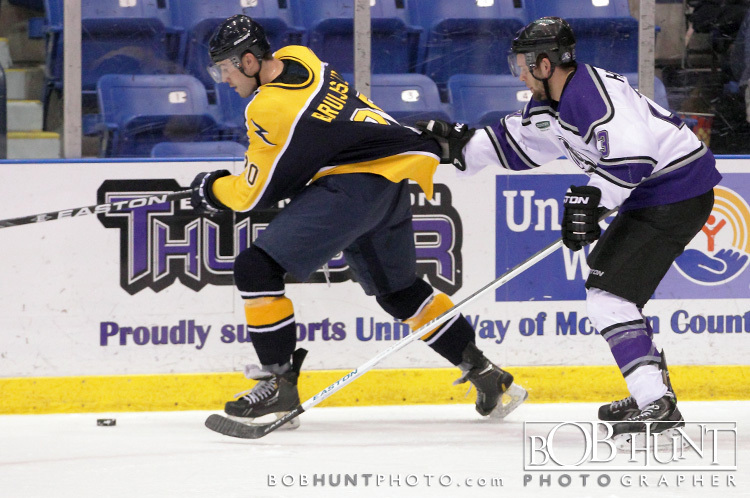 A bad bounce ended up off the back of Thunder goalie Max Strang and into the net on a goal by Luke Greiner on a power play, but Kevin Walrod answered by tipping a Burke Gallimore drive from the high slot on a power play also assisted by Travis Granbois with 14:07 showing on the first period clock. 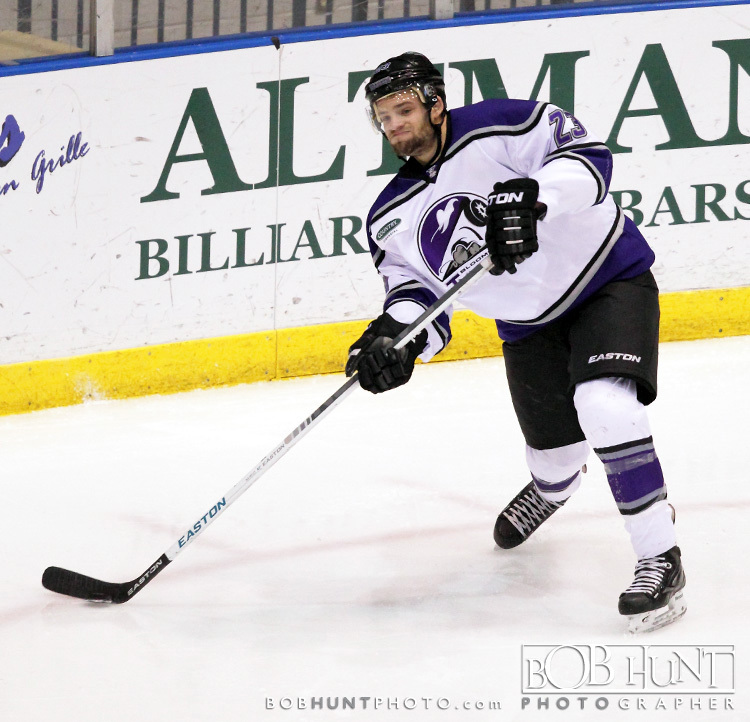 Yet another power play goal gave the Surge a 2-1 advantage with 10:55 left in the opening chapter on a drive by Kyle Kudroch at the right post. 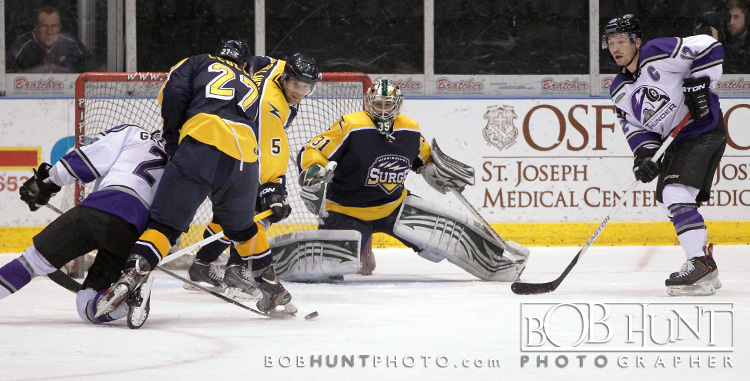 The Surge scored on another man advantage when Kudroch batted a rebound into an open net with just 38 seconds remaining before the first intermission. 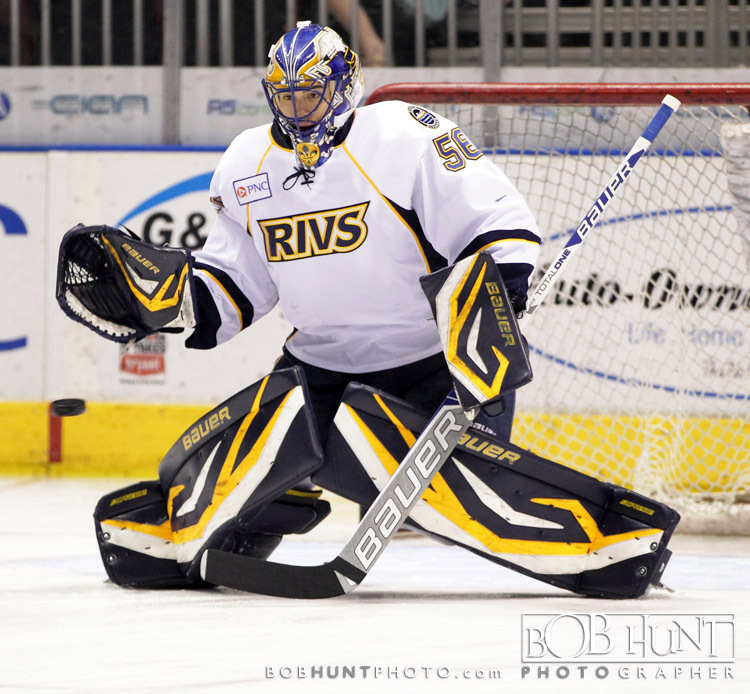 Max Strang took the loss while stopping 14 of the 19 shots he faced before being replaced after the fifth Surge goal by B.J. 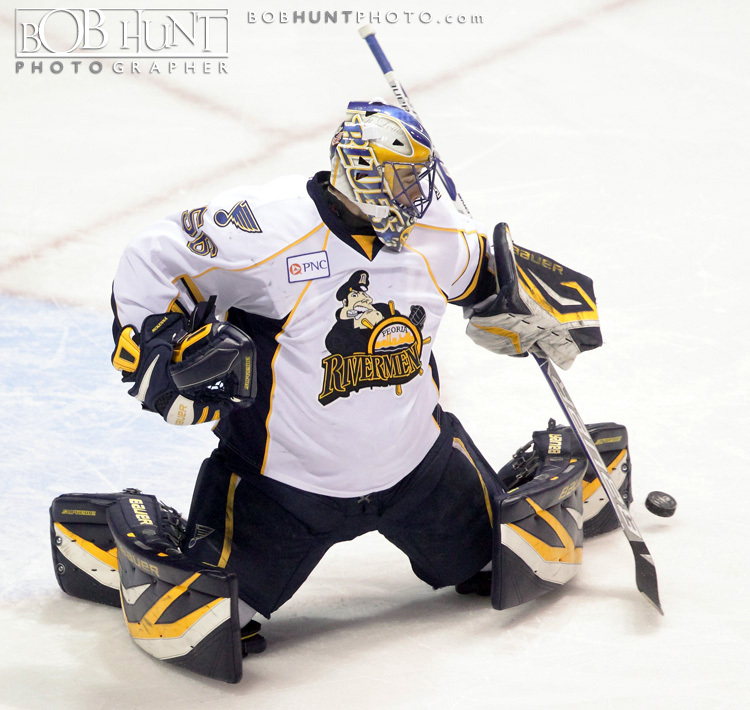 O’Brien, who saved nine of the 10 shots. 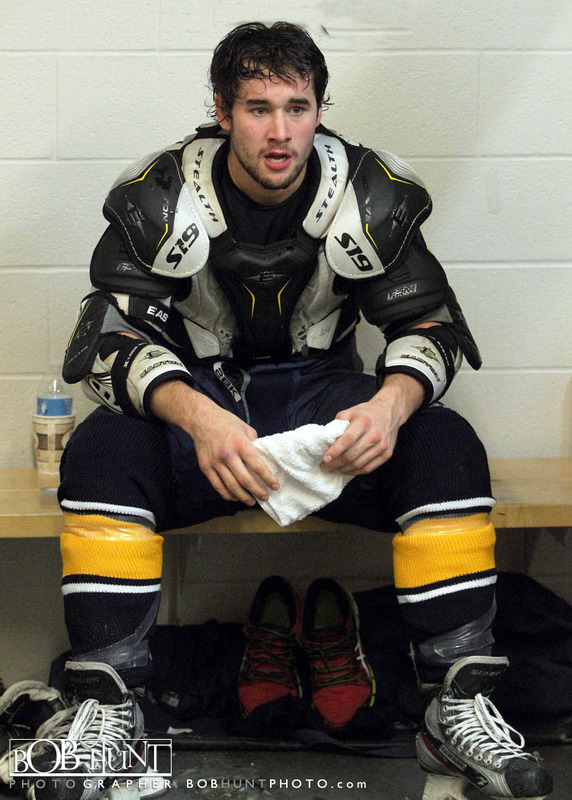 Mathieu Dugas took the win with 37 saves. 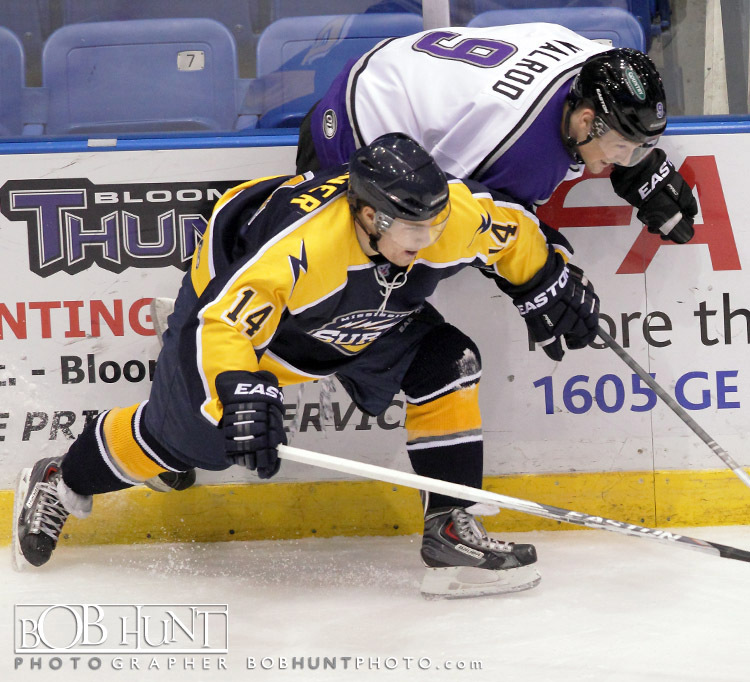 The Surge were 3-for-5 on the power play while the Thunder were 1-of-6. 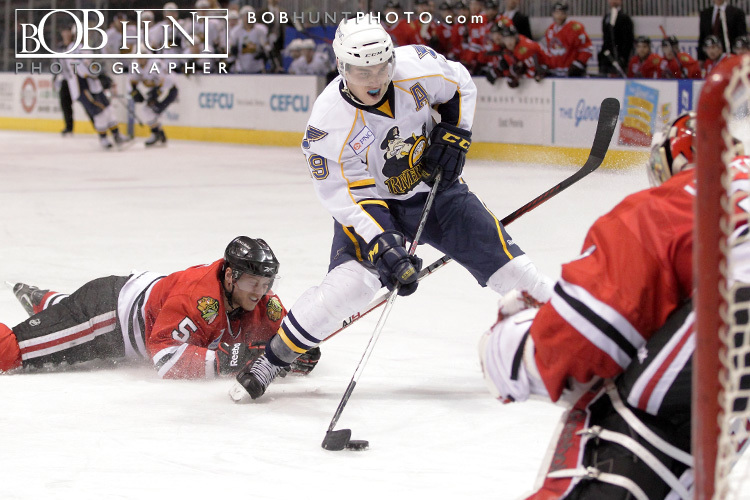 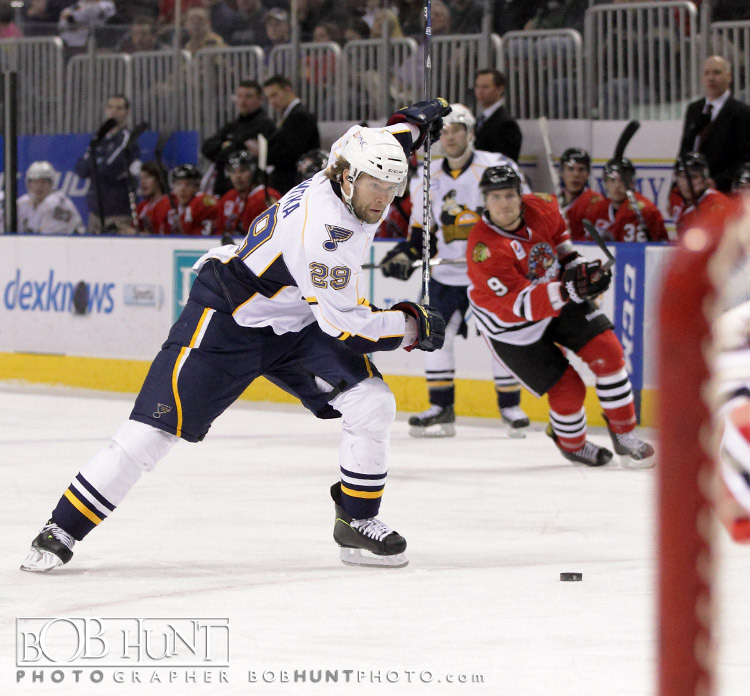 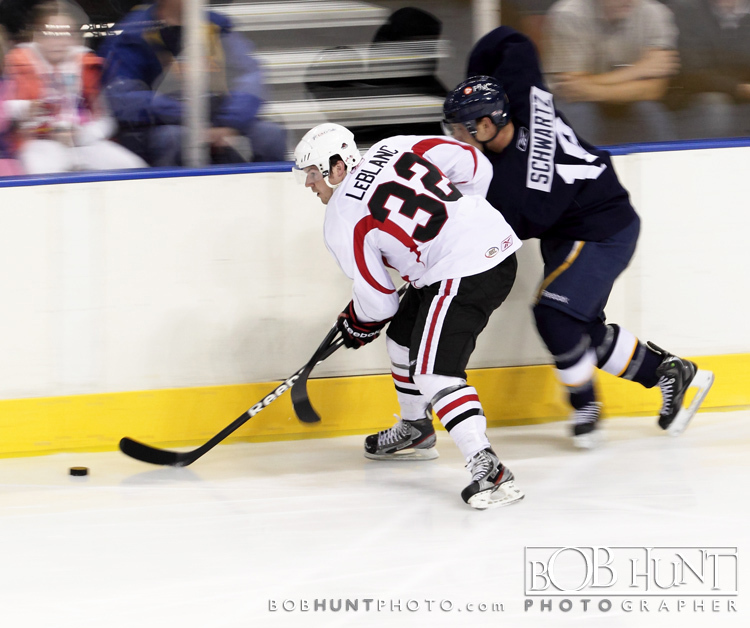 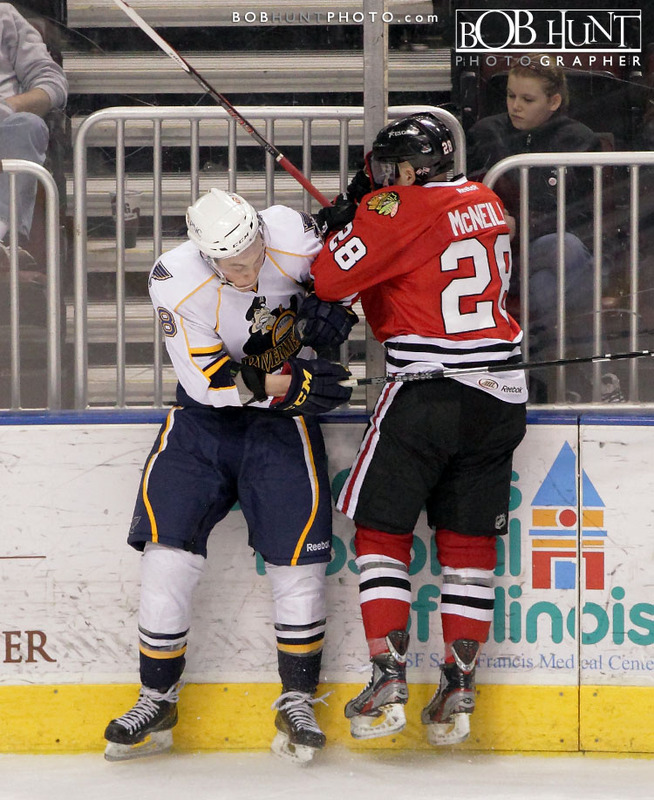 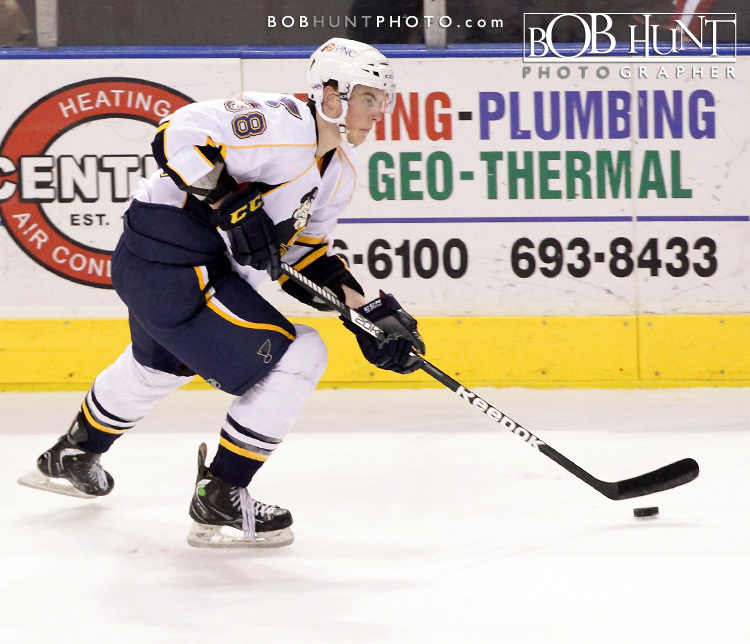 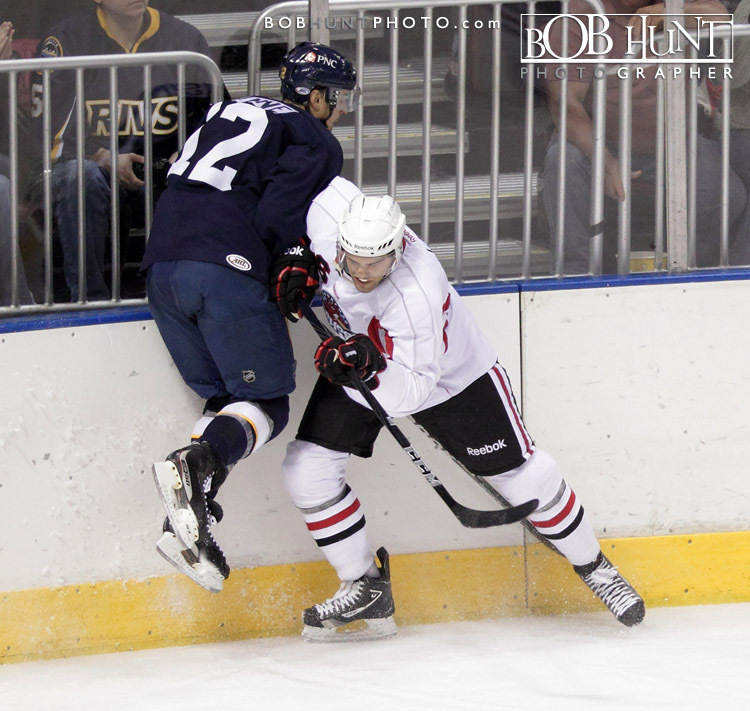 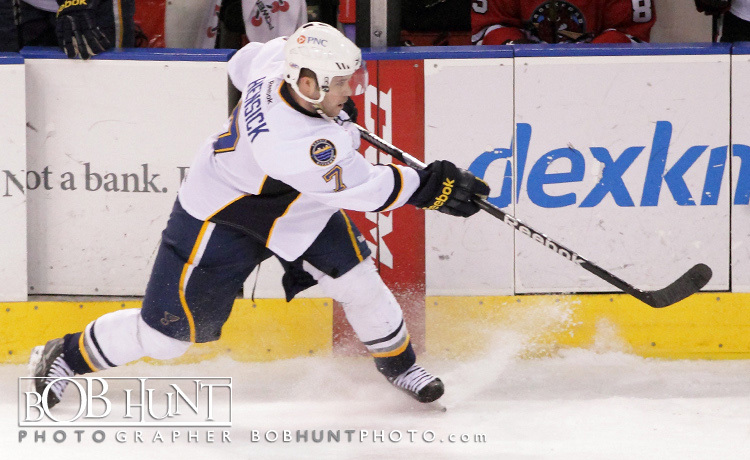 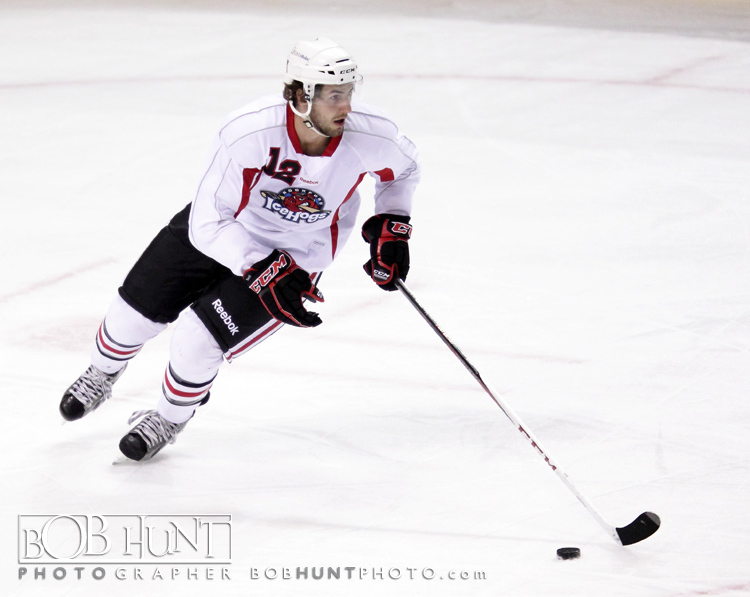 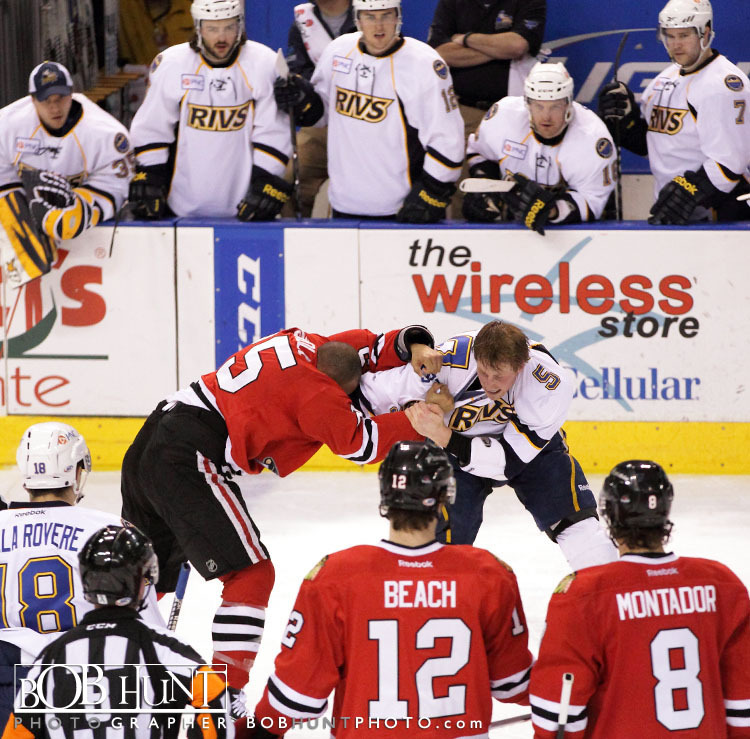 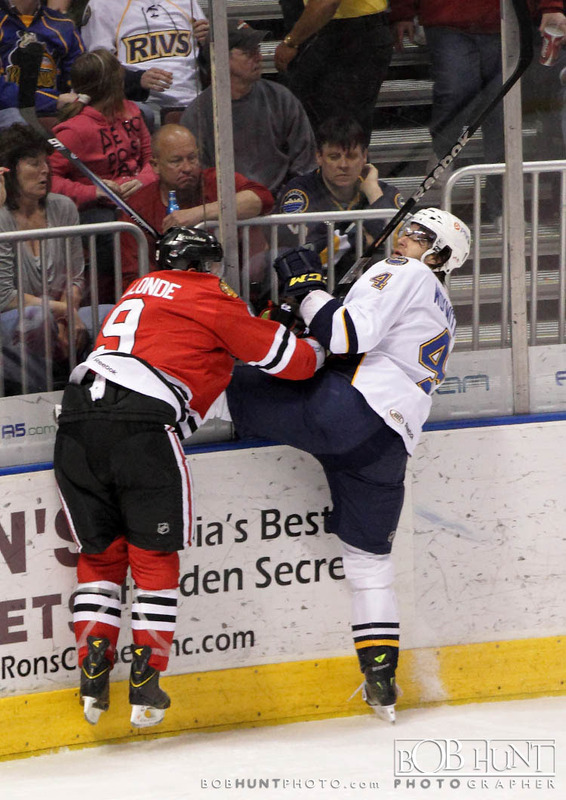 After trailing throughout most of the game, Rostislav Olesz registered his second goal, and third point for Rockford, of the game to help the IceHogs beat the Peoria Rivermen 5-4 Saturday evening at Carver Arena in front of 6,039 fans. 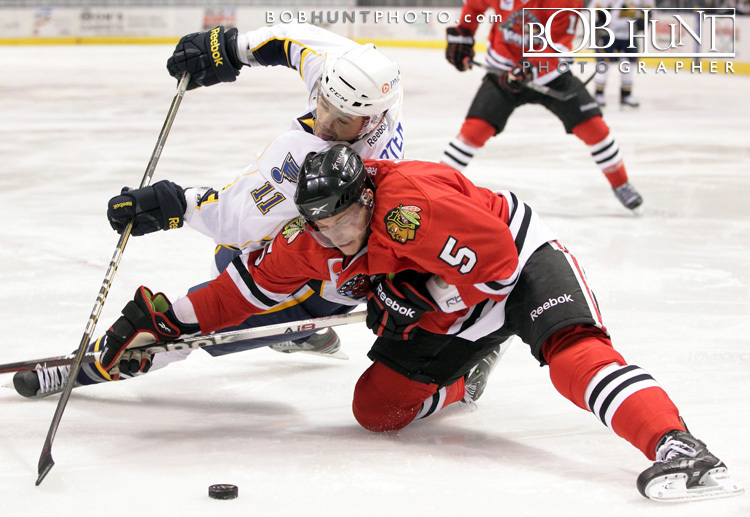 In the third period, down 4-3, a power play goal evened the score for Rockford. 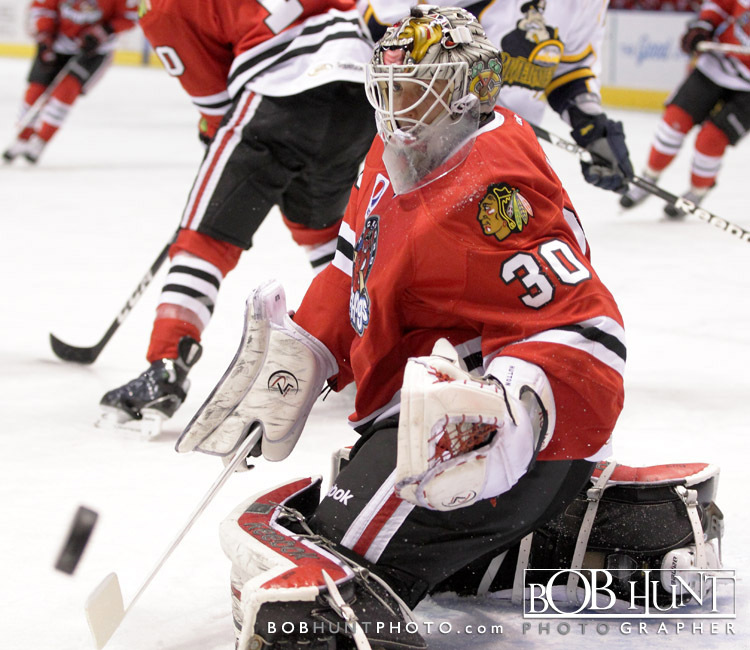 Jimmy Hayes set up Adam Clendening at the right point and the rookie blueliner blasted his seventh goal of the season past Mike McKenna through traffic at 7:28. 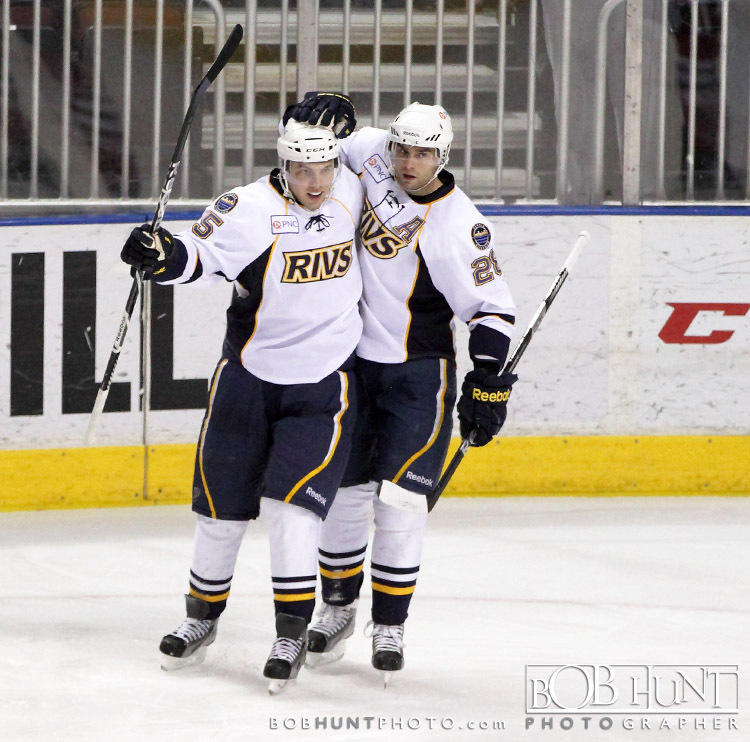 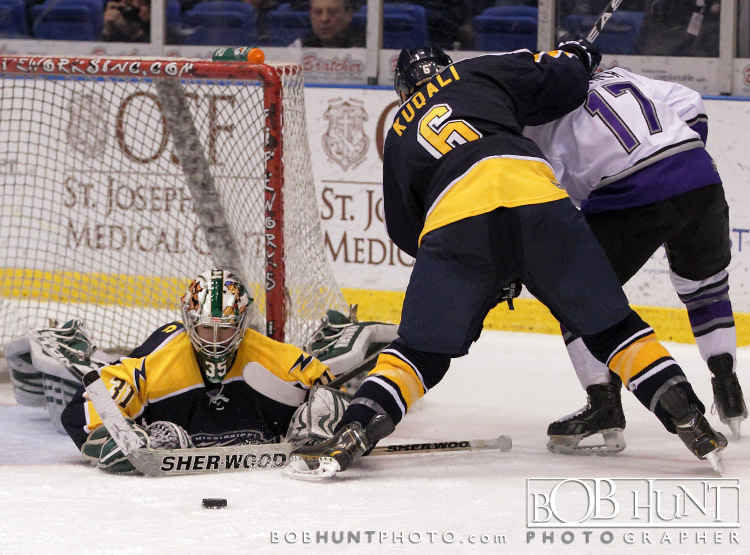 That set the stages for another Rostislav Olesz game-winning goal late in the third period. 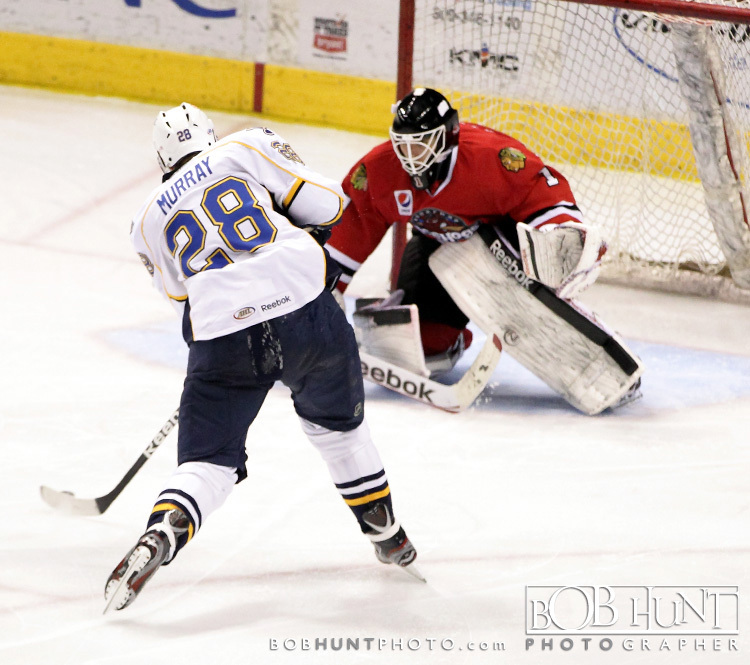 Martin St. Pierre knocked down a clear out attempt by Peoria and fired a shot in on McKenna where Olesz re-directed in his sixth goal of the season and second game-winning goal in as many nights, this one at 17:29 of the final frame. 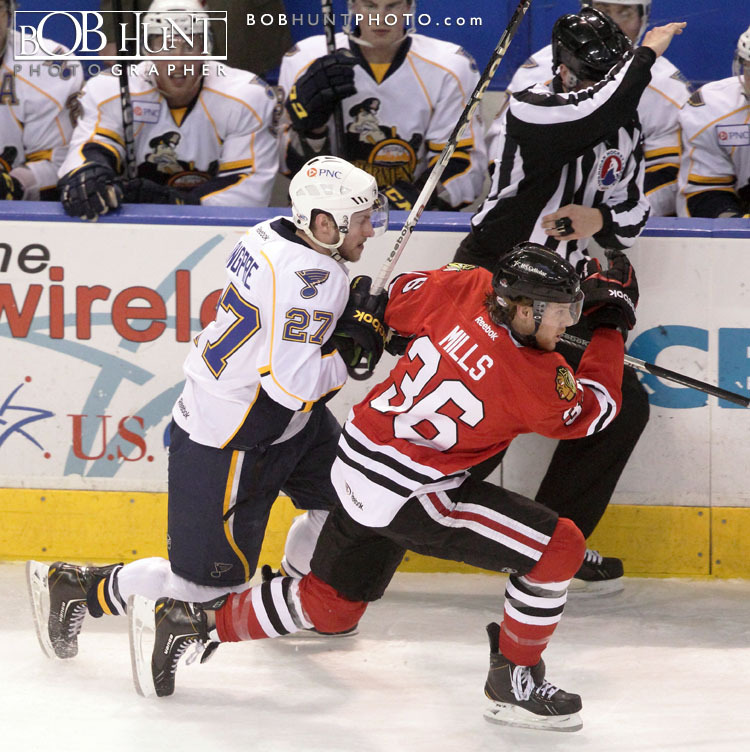 The IceHogs earned their tenth third period come-from-behind victory of the season, most in the AHL. 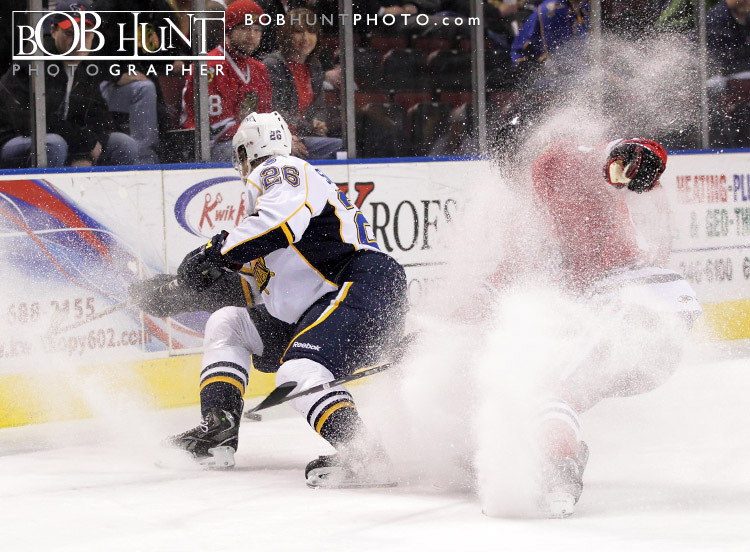 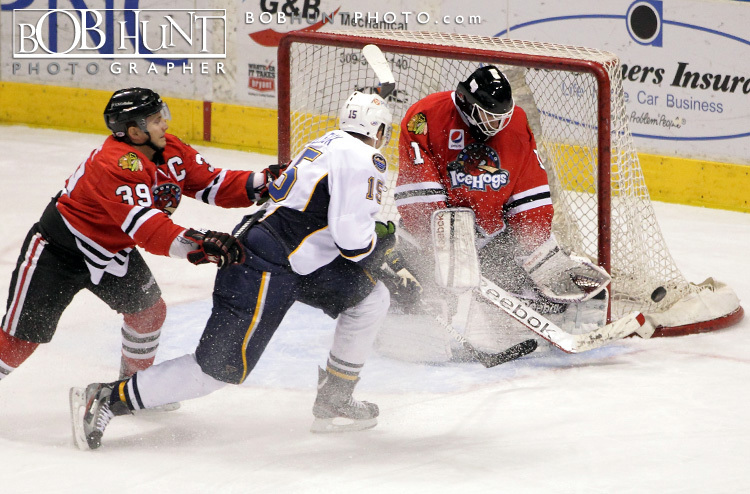 The Rockford IceHogs scored just 48 seconds into the game and never looked back on their way to a 4-0 victory over the Peoria Rivermen Wednesday evening at Carver Arena before 2,791 fans. 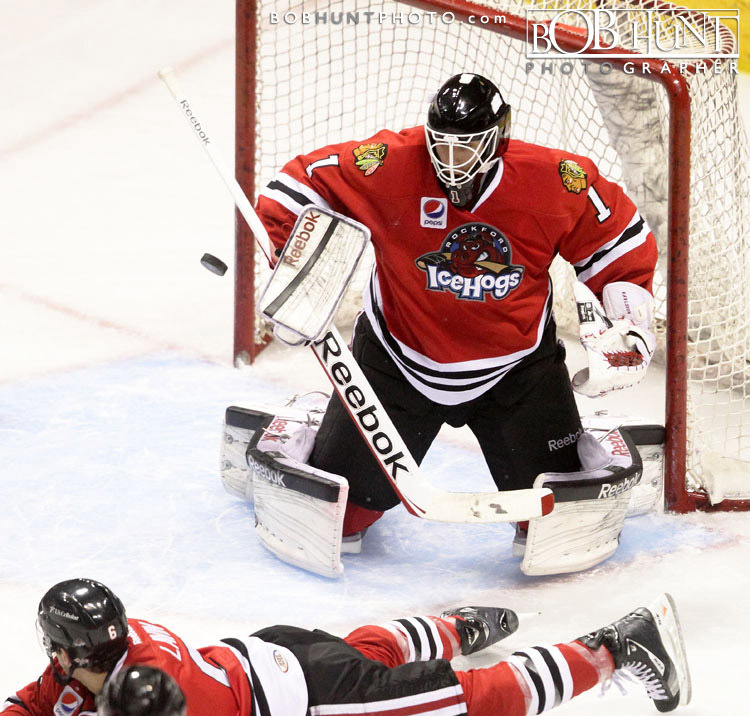 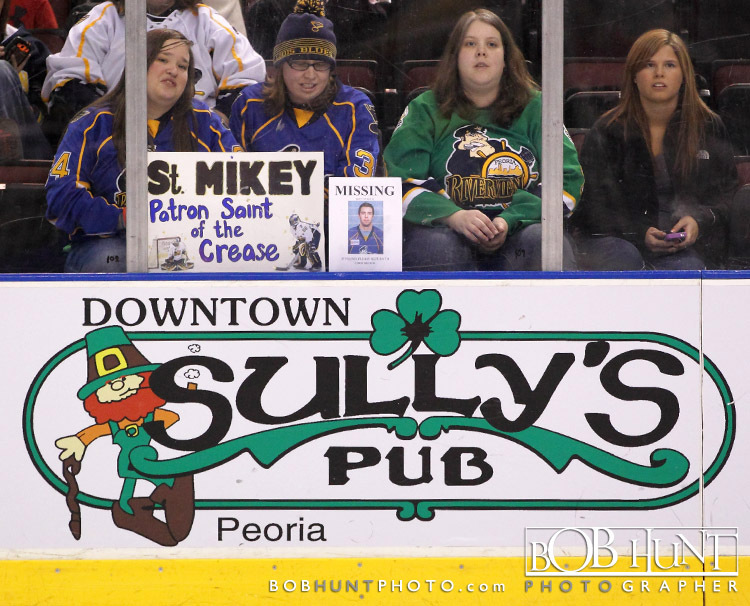 Despite six power play opportunities and 35 shots on goal, Peoria was never able to find the back of the net. 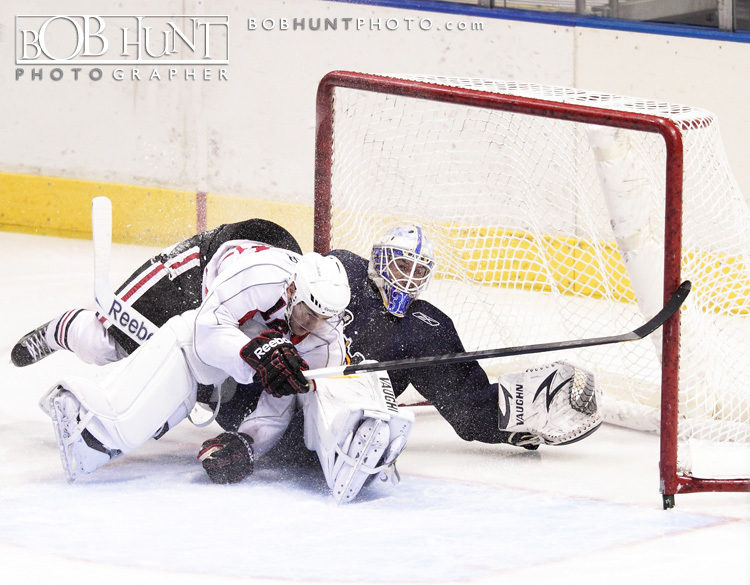 In the opening minute, Terry Broadhurst deflected a shot past Mike McKenna for his third goal of the season. 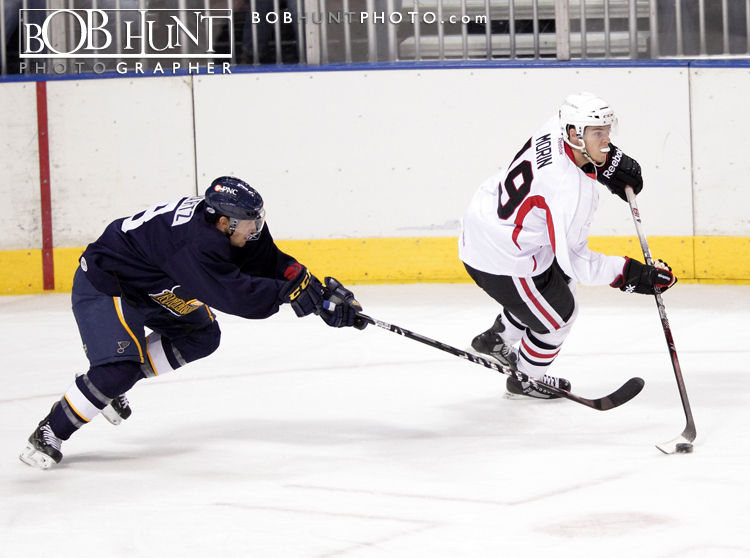 Klas Dahlbeck and Ben Youds earned assists on the early goal. 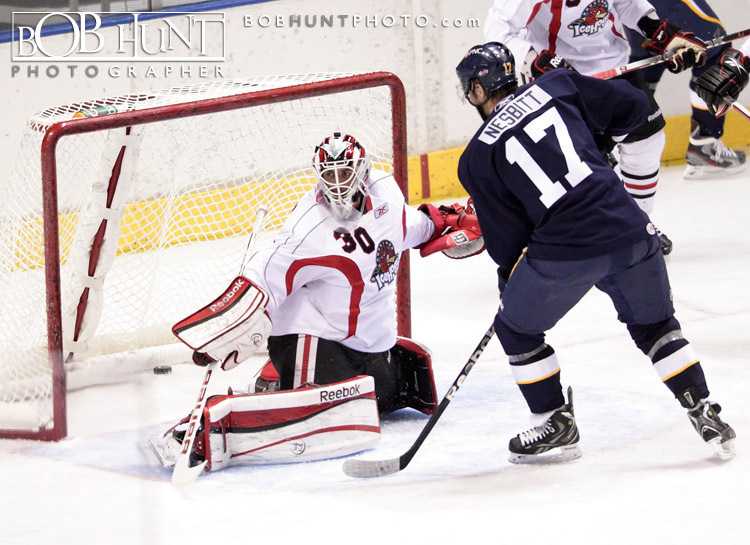 The IceHogs doubled their lead in the second period. 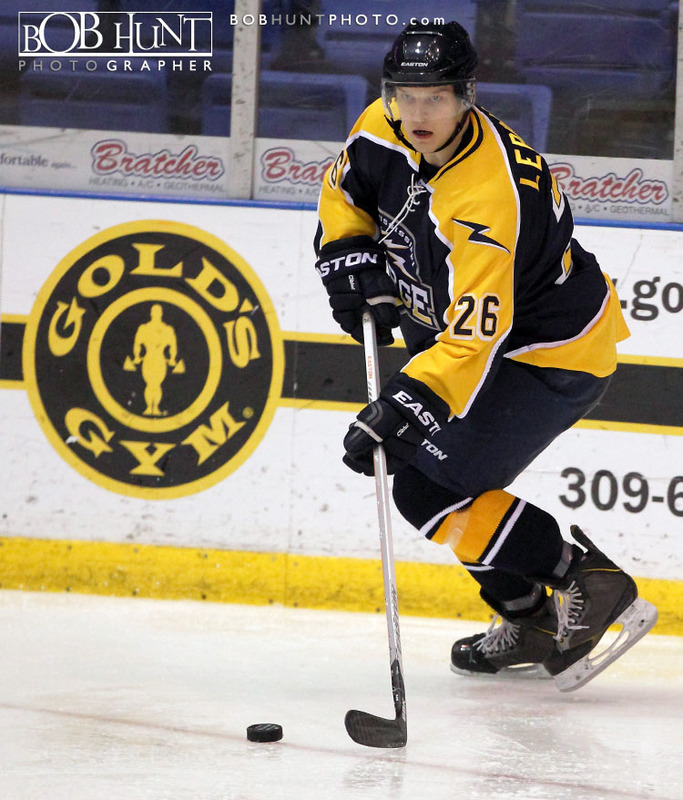 Only 4 seconds into a power play, Shawn Lalonde pushed the puck to the left circle, where Jeremy Morin one-timed his 17th goal of the season at 9:20. 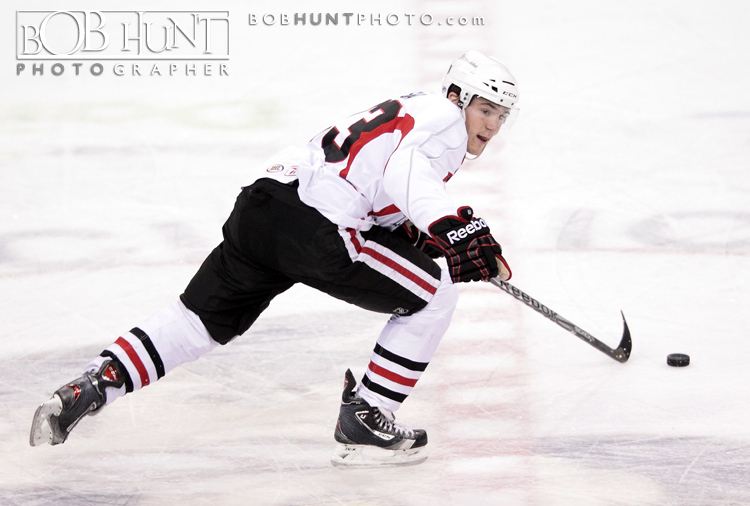 Brad Mills also was credited with an assist on the play after winning the face-off. 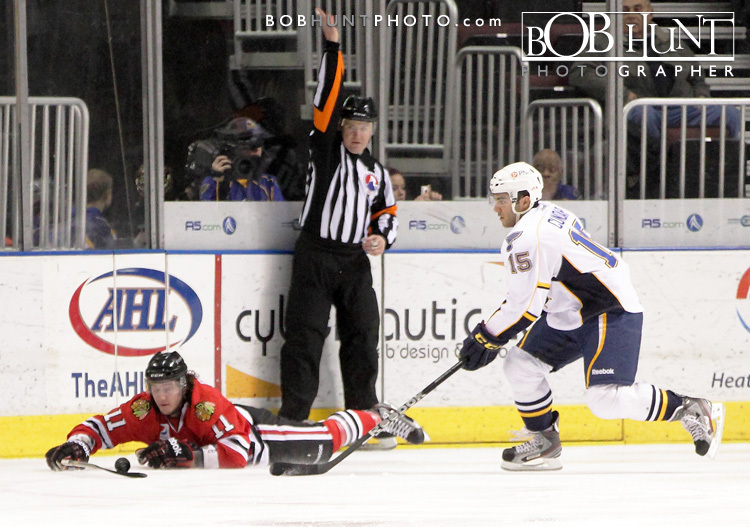 Peoria went 0-for-6 on the power play as Rockford went 1-for-4 on the man advantage. 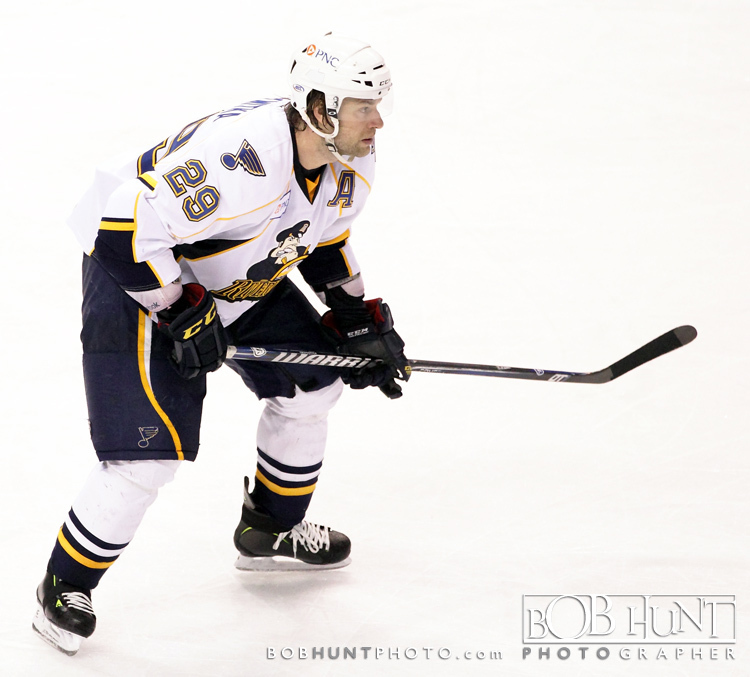 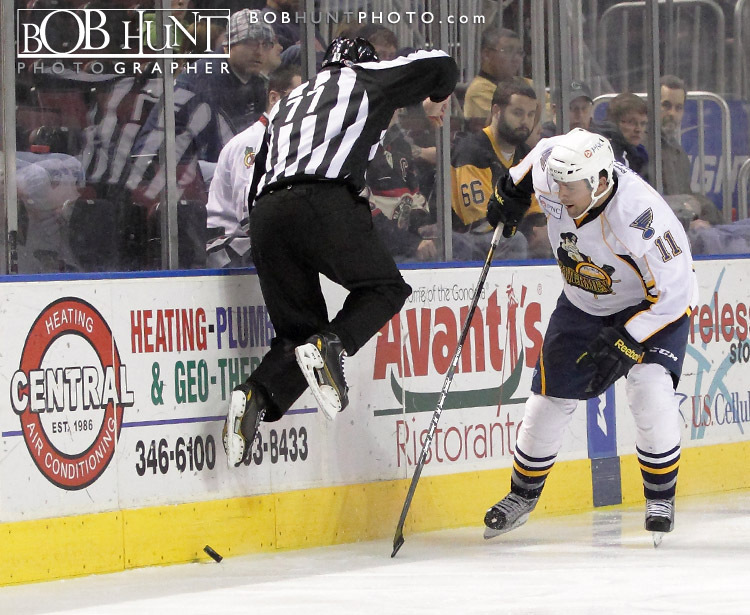 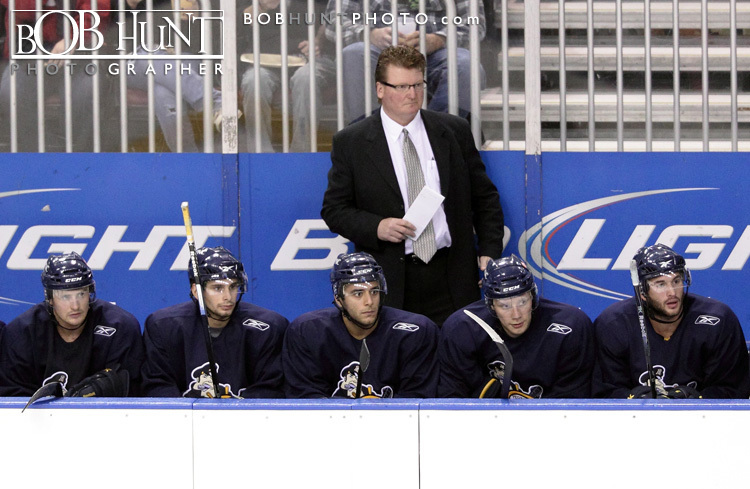 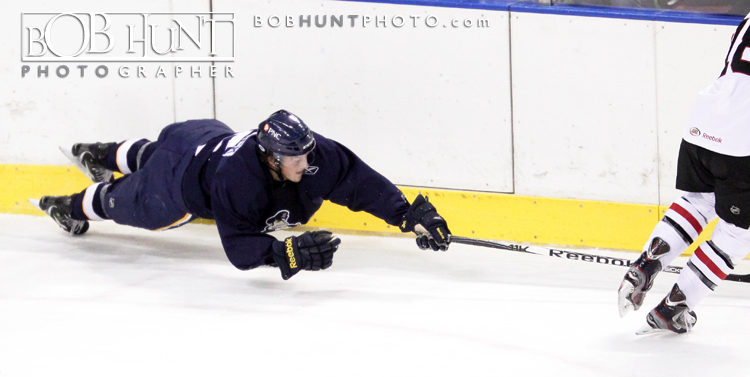 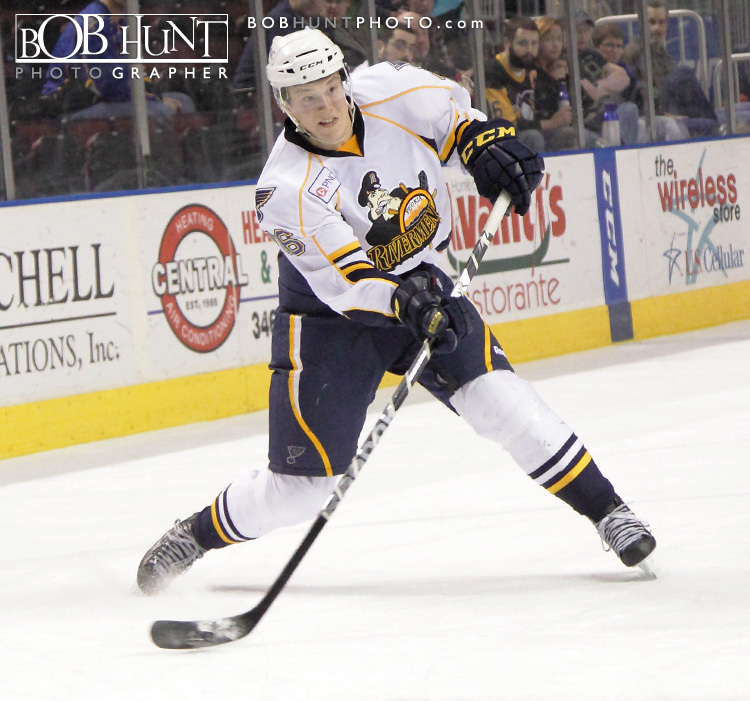 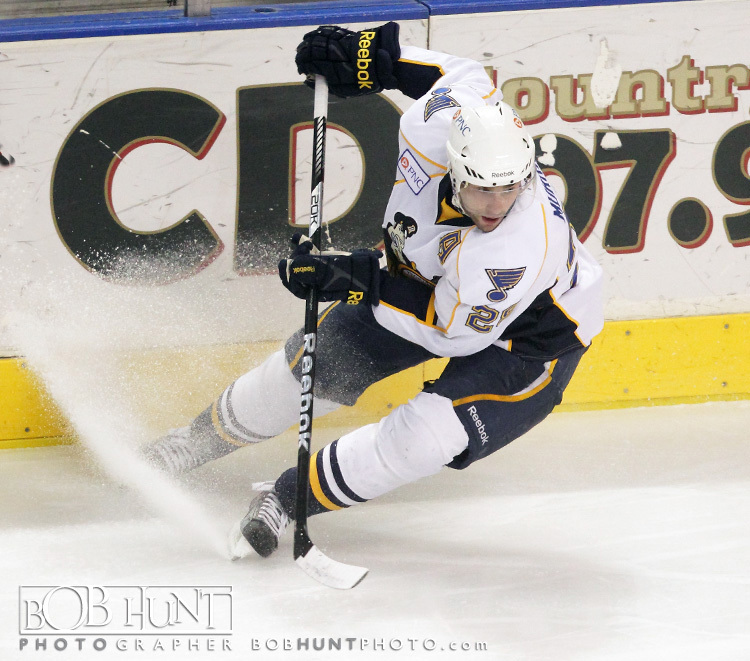 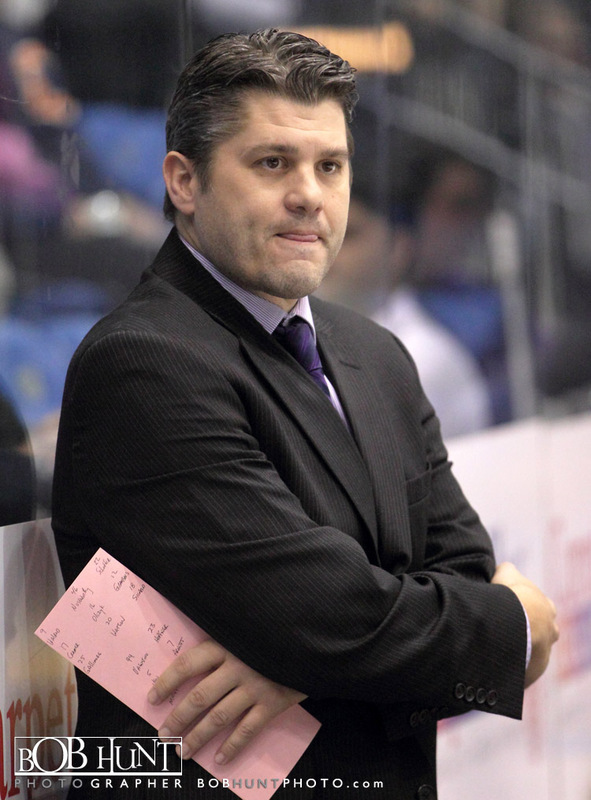 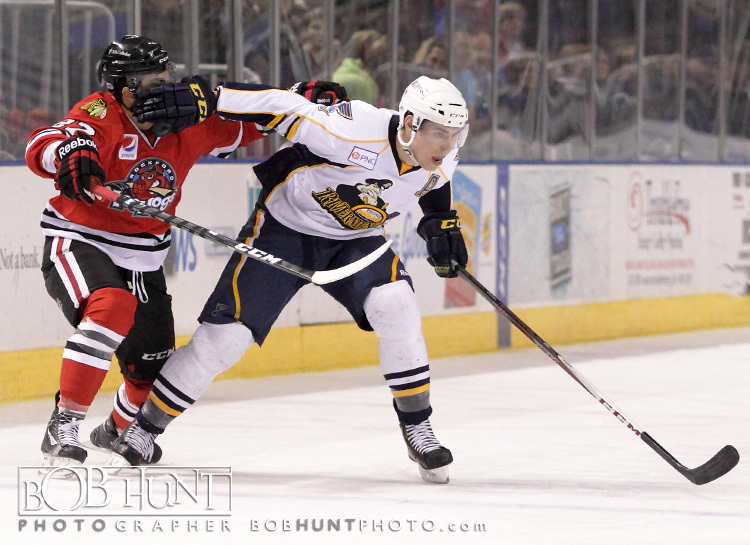 The Rivermen outshot the Heat 35-24 in the game. 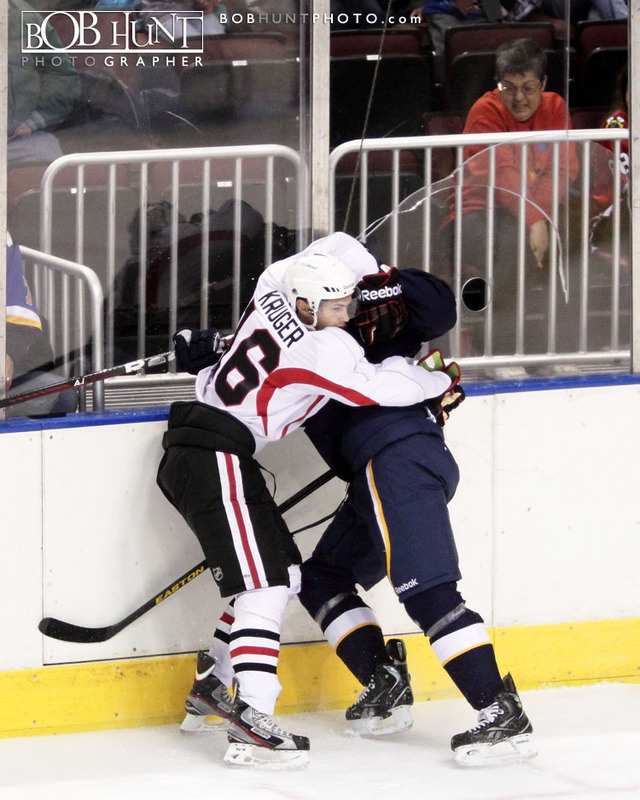 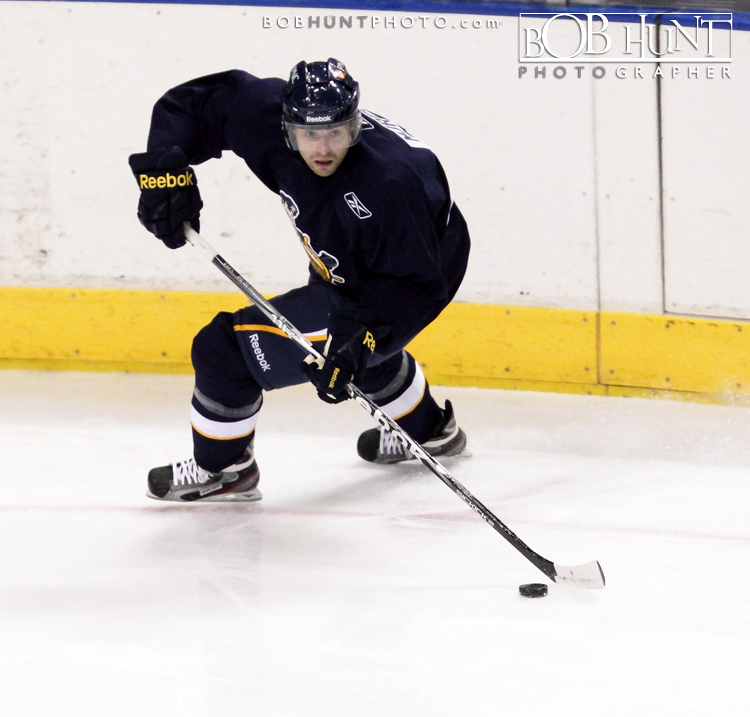 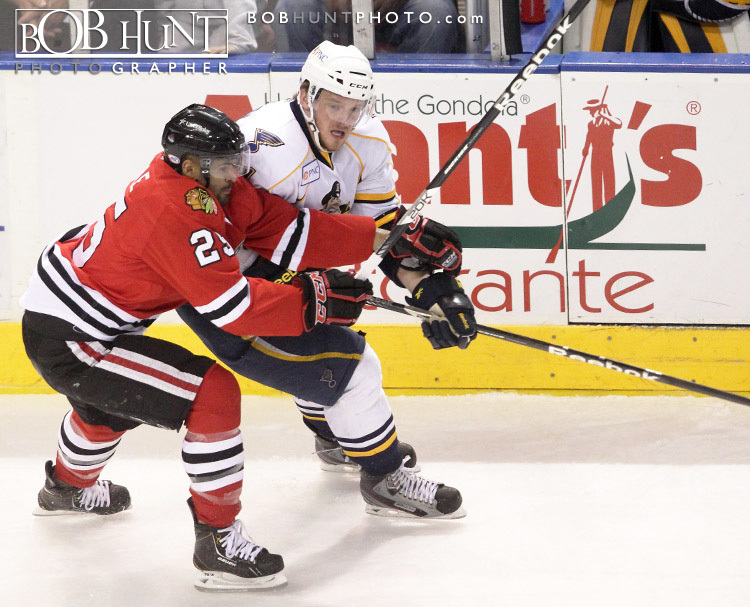 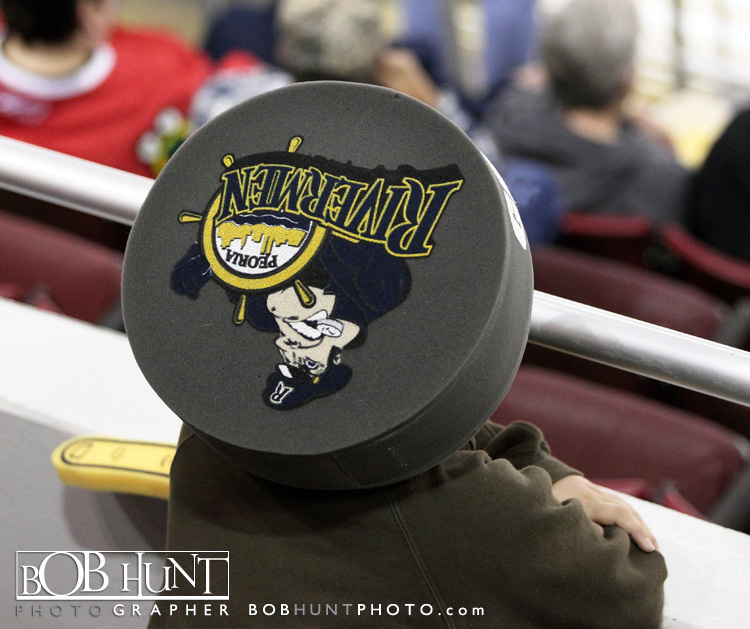 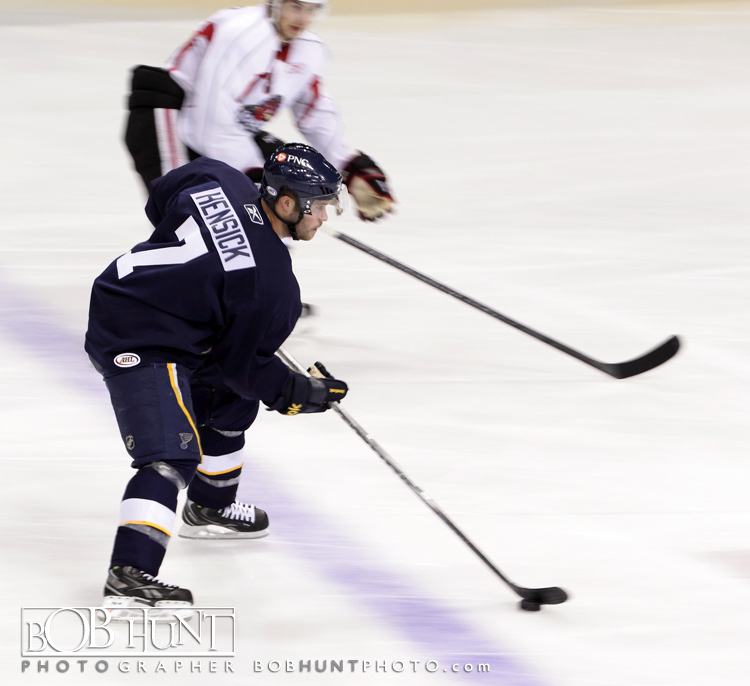 The Peoria Rivermen finished the preseason with a 2-1-0 record after a 5-3 loss to the Rockford IceHogs on Saturday at Carver Arena. 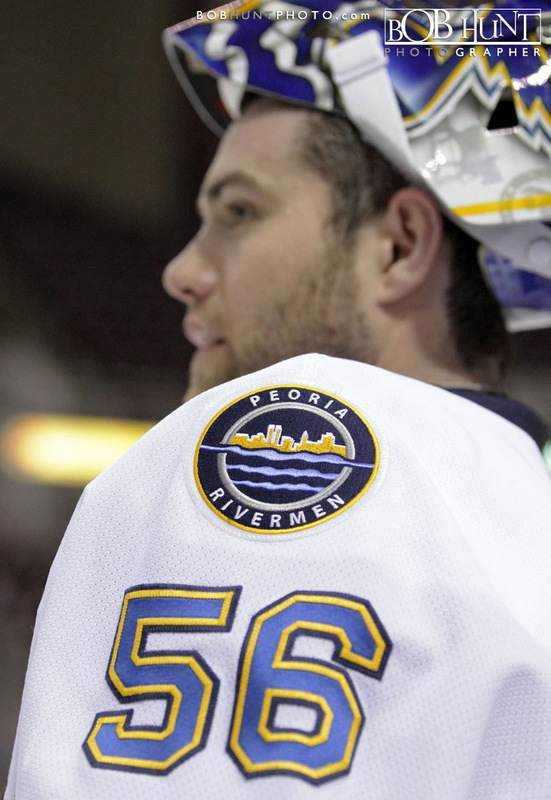 Peoria goalie Jake Allen made 24 saves in his only action of the preseason while Adam Cracknell, Derek Nesbitt and Phil McRae scored for the Rivs. 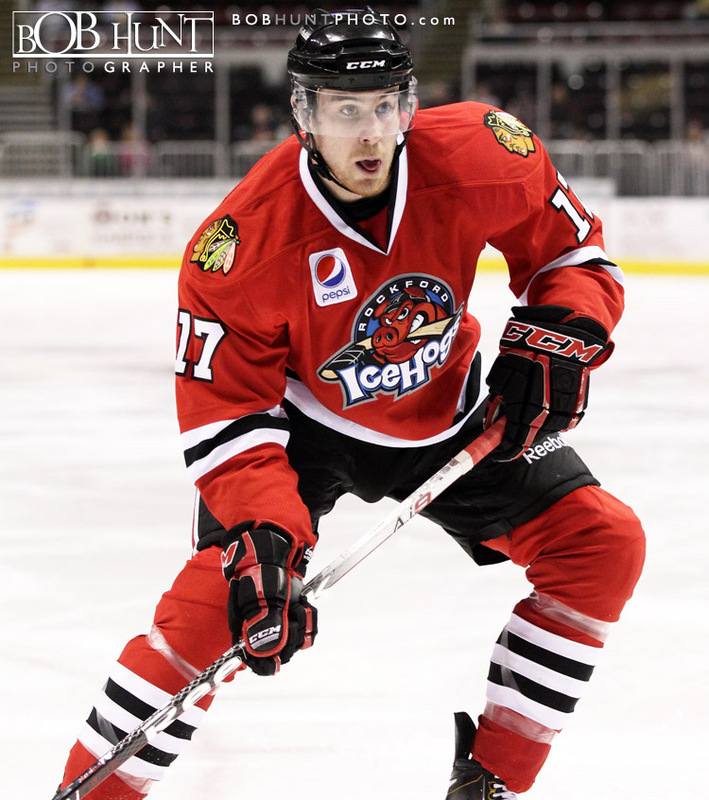 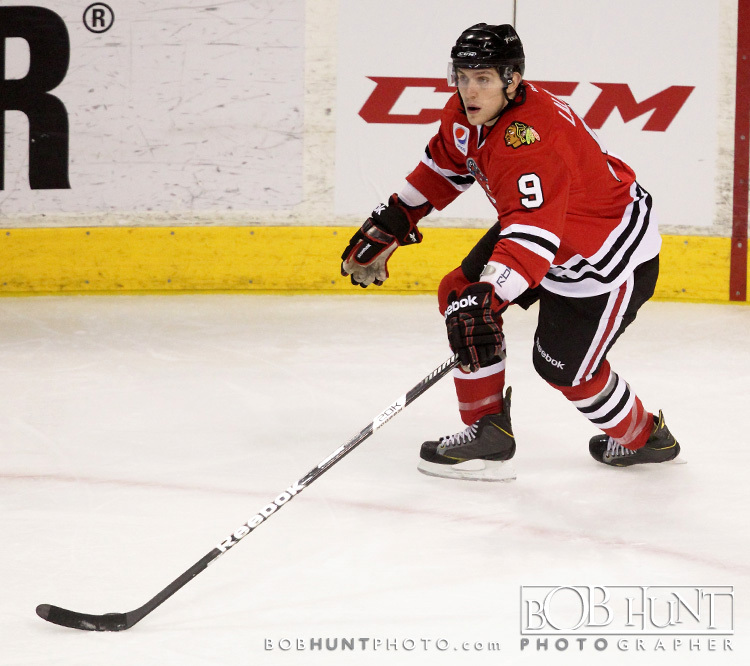 The IceHogs behind a strong showing from the line combination of Jimmy Hayes, Marcus Kruger and Brandon Saad combined to score four goals and three assists. 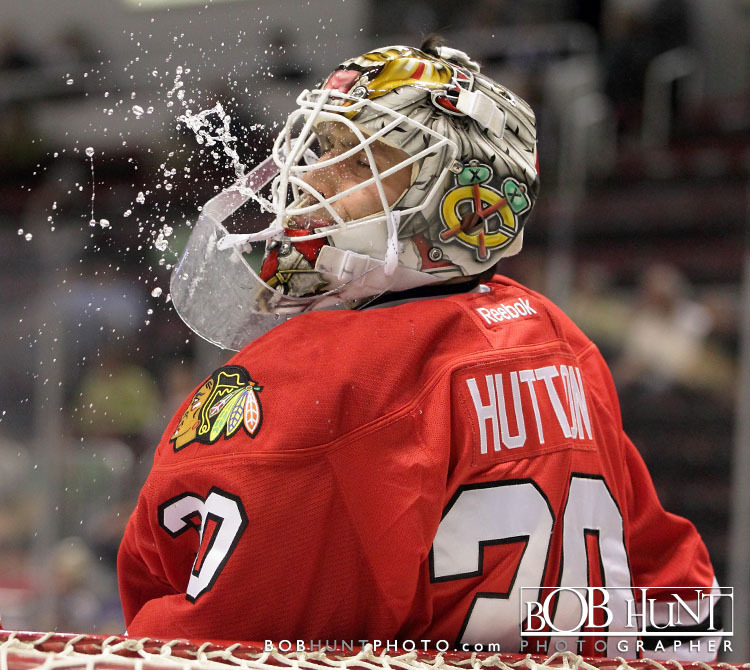 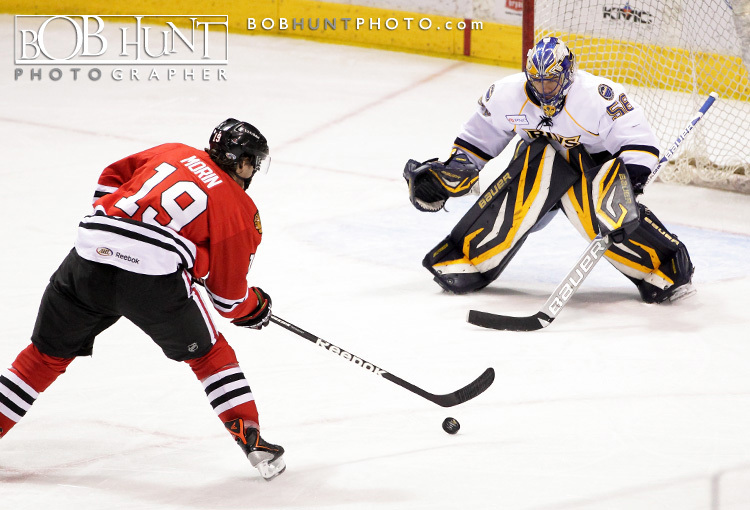 Rockford goalie Carter Hutton went the distance making 13 saves on the night.